We've gathered all available offers on Drinks at Sainsbury's. Browse their extensive range, compare prices, reviews & awards and compare their offers to other top UK supermarkets. Make great savings on all your favourites at Sainsbury's now. 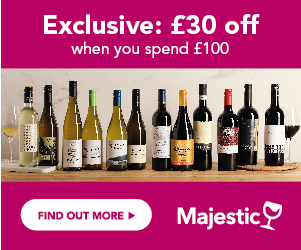 Find special offers on Wine, Prosecco, spirits and many more! PLUS, right now you can save £20 on your first groceries order at Sainsbury's online. It's simple, spend £80 or more and apply the code 'AFFWD40RPA' at the checkout for your £20 discount! Ends 2nd May 2019. *Offer ends 11th December 2018. Offer not available in Scotland. Excludes bottles of wine under £5, bottles 200ml and under, all House wine, all fortified wine, boxed wine and gift sets. Subject to availability. Selected stores only. While stocks last. Offer excludes centrals and locals. Offer available online. Offer applies to online orders delivered from 26 November 2018 until and including 11th December 2018. Online delivery charges apply. Maximum of 36 bottles per customer per online order. The licensing laws only permit the sale of alcohol for certain permitted hours. See In store for details. The law does not permit the sale of alcohol to persons under the age of 18. Please drink responsibly. You may be asked to provide ID to prove you are of the required legal age to purchase an age restricted product. Sainsbury's is one of the biggest UK food retailers with over 600 supermarkets, 800 convenience stores, and nearly 250,000 online orders every week. They offer competitive prices and impressive drinks and wine selection, frequently delivering new tastes and varieties. They are proud holders of 'Taste the Difference' brand, often awarded at international wine competitions. There is a £25 minimum order value on any grocery order. Same Day Delivery: available in selected stores, please enter your postcode on the website to find out if the service is available in your area. The cut off for placing Same Day Order is 12:00 (midday) on the day of delivery or collection (This includes amending your order). The earliest delivery slot for Same Day Orders is 6pm-7pm. Click & Collect: Click & Collect service is available at selected stores. The earliest you can pick up same day Click & Collect order is 4pm-5pm. Home Delivery: there is a £25 minimum order value on same day grocery delivery orders. Orders over £40 will be charged a delivery fee which will vary according to the delivery slot you choose. Orders under £40 will be charged a maximum delivery fee of £9. There is no delivery charge for same day orders over £100 booked for delivery on Monday to Thursday after 14:00. You can return any item within 30 days of receipt. You will need to provide the receipt or invoice. You can either return the item whilst inspecting the goods at the time of delivery/collection or at your own expense to any convenient Sainsbury's store . You will be offered a refund to your card within 3-5 working days. See full T&Cs on Sainsbury's website.